In George Orwell's novel `Nineteen Eighty-Four', the concept of `doublethink' was first introduced, the notion that mutually exclusive concepts could co-exist in the minds of even the best intellectuals of the day. Orwell's day of DoubleThink has already arrived. The close of 2001 has seen an unprecedented outbreak of cold events. Long-standing cold records are being broken all over the world, not just from the northern winter, but also from the southern summer. December is proving to be the coolest first summer month in much of southeastern Australia, the Sydney arsonist-lit bushfires notwithstanding. But the industry has quickly put on its blinkers. "2001 is the 2nd warmest year on record" they tell us. If this is the `2nd warmest', Heaven protect us all from a `normal' year, or even worse - a colder year than `normal'. Now would be a good time to look back on the major weather and climate events of 2001 to see if this year was in any way special. So as not to re-invent history, it will suffice to simply link to past `Stop Press' stories which appeared this year. The headlines alone are often self-explanatory, but each story can be viewed separately by clicking the link. This is not a comprehensive list of weather events for 2001, merely the ones that were reported here. Overall, the year was about average, based on both balancing warm and cold events (e.g. the October warmth in Britain, versus the blistering cold in Europe in the last 2 weeks), and based on the record of satellite measured temperatures which also shows 2001 to be close to average for the 23-year satellite record. But the Greenhouse Industry must get the wooden spoon this time for timing. Even as most of Europe is gripped in early snow and ice, the worst in decades with thousands suffering from the cold, the NOAA, supported by CRU, were proudly proclaiming 2001 as the second warmest year on record, exceeded only by the El Ni�o year of 1998. They announced this even before 2001 had finished, before all the surface station numbers were in. The numbers themselves are mostly city-based and are therefore meaningless in respect of the real climate. The satellites give the only true measure of global atmospheric temperature, and on that basis 2001 was merely average. 2001 the 2nd warmest? Sure it is - and Elvis is alive and well here in Tasmania, and pigs are flying overhead. Latest reports in the media tell of an impending disaster to penguin breeding in the Antarctic due to the same problem that traps Polar Bird - sea ice. The sea ice around Antarctica is simply more extensive this year resulting in the penguins being forced to walk much longer distances to get to open water for food. Meanwhile, Yahoo News reports that the big winter chill has struck North America, the city of Buffalo in upstate New York has had a massive record 82 inches of snowfall in the last few days. Continental Europe has been in the grip of its coldest winter in decades, and in Russia 250 people have died from the cold in Moscow alone due to a deep cold which gripped most of Russia. Here in Australia, the New South Wales bushfires have caught the headlines, but what is less reported is that Victoria, Tasmania and South Australia have had a much cooler December than usual, the first 10 days of summer being the coldest start to the southern summer on record. In spite of all the cold events around, Yahoo further reports that `climatologists' have warned that it's all caused by `global warming'! It's time to call their hand this time. Which `climatologists'? Name them, so we can all have a good laugh. Or perhaps Yahoo has no names to offer other than Green activists, who use these tragic weather events to make absurd and ridiculous claims. Yahoo, and other media outlets, also reported on the Australian bushfire emergency, suggesting that this must be a sign of global warming, one isolated scrap of `hot' news to counter the sobering effect of all the `cold' news around lately. The Australian bushfires are certainly caused by human activity - arsonists. Yahoo's `climatologists' cannot seriously point to those bushfires as indicative of `global warming' when no sooner are fires put out than arsonists are re-lighting them. We don't know why or by whom these acts of fire terror are being committed, but they are criminal acts, not indicators of climate change. The cure is not Kyoto, but forceful application of the law against the arsonists. Furthermore, periodic severe bushfires are normal in the Australian environment. There is no way we can prevent them other than to totally deforest the country. What makes these recent fires abnormal are the arsonists, not climate change. I would challenge any `climatologist' to put their hand up and identify themselves publicly if they think otherwise, because Yahoo's `climatologists' are safely anonymous in their coward's castle. There is another way of looking at the chilly finale to 2001. It may be Mother Nature's middle finger to claims that 2001 was the `second warmest year on record'. The institutions making that claim (CRU and the NOAA) have only made themselves look ridiculous in the process, particularly as the satellites show 2001 only to be average. The Tasmanian Devil is a species of marsupial carnivore unique to Tasmania (see photo of devil below). While its habitat is restricted only to Tasmania, it is abundant here and in no way endangered - except apparently by science. Now `science' wants to research their reproductive system as outlined in this University of Melbourne application to the Tasmanian Government. This media report in the local press first alerted the public to the full implications of this sick proposal, with the period for public consultation being indecently hasty, covering the holiday period. No Christmas presents for the Devil it seems. It is not the desire for research which is in question here, but the methods the scientists propose. It involves the indiscriminate killing by decapitation, and the mutilation of, wild devils, most of them pregnant females. "We expect that we would need to catch about 30 females of which we would kill up to 20 to obtain fetuses. The remaining 10 will be used to sample their own pouch young and the adults released." the application states. Will it stop at 30? The submission says that since it requires invasive surgical procedures to determine if the female is pregnant or not, it might require the capture and death of more than that number to achieve the desired number of pregnant females. "In addition to these females, we also request five adult male devils to be euthanased to remove their reproductive organs for comparative anatomy.."
The Tasmanian Devil is held in special affection by Tasmanians and this proposal by the University of Melbourne is both sick and motivated only by research for research's sake. It has no long term value to the Tasmanian environment, to the devils, or to the people of Tasmania. It involves cruelty to a large number of innocent native animals for no better reason than to indulge the scientific ambitions of an institution which is not even Tasmanian. This is the thermometer mounted under the verandah of my house, 13 kilometres from Launceston. It is accurate and shows a temperature at 11 a.m. on Christmas Day of 11�C., (or nearly 52�F.). The wind is westerly, with a cold biting wind from the Southern Ocean. That's typical for lots of people at Christmas. But - this is mid-summer down here. This photo is not from Canada or Sweden, but from sunny Spain, taken during the hard cold snap which has affected most of southern and eastern Europe. 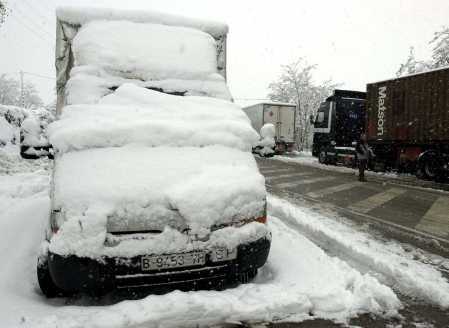 It shows a van completely covered in snow on a road on the outskirts of Barcelona, Spain Saturday, 15th Dec, 2001. Freezing temperatures and heavy snowfalls have been reported as far south as Greece and Turkey, and in northern and eastern Italy. While the industry got all hysterical about how `warm' October was, there is now a deafening silence as to how to explain this latest cold turn in the weather. Weather is not climate. Exploiting weather events to make alarmist claims about climate is both dishonest and self-defeating. Cold events are often reported on this website, not to make claims about climate change per se, but to demonstrate the inherent dishonesty in making sweeping climatic claims whenever there is a warm event. Next year, Spain could have a blistering heat wave, but it will be no more significant climatically than the present cold snap. The US state of Michigan is not the first place that springs to mind when we think about `environment'. After all, that's where all the big American cars are made. Skeptical Environmentalist (Cambridge University Press, 2001) was published recently, there was the usual hysterical reaction from environmentalists claiming that Lomborg was gilding the lily when it came to environmental issues. Lomborg cited various studies to assert that environmental conditions were not nearly as bad as claimed by Green groups and indeed were steadily improving rather than getting worse. A new report from Michigan (State of Michigan's Environment 2001: First Biennial Report - published jointly by the Michigan Dept. of Environmental Quality and the Michigan Department of Natural Resources) comprises sixty pages of what can only be called `good news' on Michigan's environment. Nearly every indicator from temperature (guess what - no warming), snowfall (increased), bald eagle nests (increased), lichen species (increased), carbon monoxide levels (reduced), six key pollutants (all reduced), air quality (general improvement across the state), radioactive particles (big reduction), and forest volume (increased). Lomborg got it spot-on and it's the environmentalists who seem blind to the big improvements going on all around them. Three recent studies have put the variability of the Sun back in the centre of the climate debate. How much of recent climate trends have been caused by human activity, and how much by the Sun? To listen to the IPCC, the Sun is small beer compared with greenhouse gases, but three new scientific studies suggest otherwise. Gerard Bond et al, (`Persistent Solar Influence on North Atlantic Climante During the Holocene', Science vol.294 16th Nov) have demonstrated through a study of `cosmogenic nuclides' and sediment remnants of old drift ice, that the brightening and dimming of the Sun may account for a 1,500-year cycle of cooling and warming in lands bordering the North Atlantic. Bond told CNN, "Whether the whole Earth is affected, we do't know for sure yet, but it is certainly implied." Although he only found a 0.1% change in solar energy levels, this appears to be sufficient to trigger quite severe climatic changes such as happened with the Medieval Warm Period and the Little Ice Age. The postulated cause, according to Bond, was the amplifying effects of solar radiation changes on ocean Thermohaline Circulation. The seond study (Shindell et al., `Solar Forcing of Regional Climate Change During the Maunder Minimum', Science v.294, 8 Dec 01, p.2149) reinforced the findings of the first, namely that one of the major climate events of the past millennium, the Little Ice Age, was itself forced by a small decrease in Solar radiation. The third study was astronomical - observations taken of the southern ice cap on Mars by Dr Maria Zuber of NASA have shown that pictures captured by the orbiting Mars Global Surveyor (MGS) of pits and other icy features on Mars' south pole show changes in ice cover over just two years. The study compared Martian conditions in 1999 with those of the same area in 2001. Between 25 to 50 % of the features measured had eroded by 1 - 3 metres during the past Martian year. Does this report of receding Martian ice remind us of anything? Earth glaciers perhaps? Mars cannot be affected by Earth's climate, so it's a strong possibility that Mars is being subject to the same climatic stress the Earth is undergoing - changes in the Sun. The IPCC in its quest to deny any climatic role for the sun have sought to deny its most obvious and well-documented effects, the Medieval Warm Period (900-1200 AD) and the Little Ice Age (1600-1880 AD) through promotion of the notorious `Hockey Stick' theory which claims, absurdly, that climate was steady and benign for 900 years until the 20th century humans came along. But talk of the Sun is taboo in IPCC circles. serious scientific debate, and as a result should be ignored and pilloried." `Ignored and pilloried'? Firstly, someone sporting a `Dr' before his name should know better than to make a public demand for what are mutually exclusive actions. You cannot `ignore' someone if you are at the same time subjecting them to public pillory, and you cannot `pillory' someone if you are also ignoring them. And what does `pillory' mean exactly? According to the Oxford English Dictionary it has two meanings. To `pillory' (verb) is to "expose to public ridicule or contempt". On the other hand, a `pillory' (noun) is "a device for punishment, usually a wooden framework mounted on a post, with holes for trapping the head and hands, and in which an offender was confined and exposed to public assault and ridicule." Verb or noun, we get the picture loud and clear. Viner's attitude has more in common with the priests of the medieval inquisition than with those early heroic scientists who suffered at the hands of those priests. With his call for skeptics to be `pilloried' we appear to have gone full circle, many of today's climate `scientists' now playing the role of medieval `defenders of the faith', undeserving and unworthy inheritors of the mantle of Galileo. The greenhouse industry is quick to exploit all-time `hot' records when they can find them, but we never hear of the all-time `cold' records. To correct that imbalance, here's one from my home patch here in Tasmania. In November this year, Tasmania experienced the coldest November in 33 years. In particular, Launceston and Fingal in the northern half of the island recorded the all-time coldest temperatures for November on 18th November. This on the heels of a similar all-time cold record set in Launceston for May this year. The first three days of December, the start of our summer, has seen households all across the island forced to light up their domestic wood fires. December has started out very cold and the cold weather is expected to continue for another few days at least. But who in the major northern hemisphere centres has heard of Tasmania? A big fuss was made of Central England during October, but will anyone make a fuss about Tasmania's May, November, or December? - in an area every bit as big as central England? We just have fewer people - and fewer roads and buildings. It is said that if you torture statistics hard enough, they will tell you anything you want them to. The growing gap between the (warming) surface record of global temperature and the (neutral) temperature of the lower troposphere (i.e. lower atmosphere from 1 km to 8 km altitude) obtained from satellites, has put claims of recent global warming into considerable doubt, and also throws doubt on the soundness of the models that predict future warming. Most of the surface warming is actually caused by urban heat islands and bad maintenance and geographical spread of ground-based thermometers in developing countries. The satellites prove it, since they do not find the `global warming� so earnestly sought for by the industry. First, there was an inconclusive report from the National Academy of Sciences, and now we have a new paper titled "Accounting for the Effects of Volcanoes and ENSO in Comparisons of Modeled and Observed Temperature Trends," in the November edition of the Journal of Geophysical Research - Atmospheres. Authors representing LLL, NCAR, GISS, CRU and the Max Planck Institute all contributed to this paper, which was merely a statistical dissection of the temperature records from the surface and satellites, comparing them with the usual `models� - (there�s always a `model' in there somewhere). Quite why a statistical analysis should be authored by 5 major institutions is unusual in itself. A single author could have done it easily on an ordinary PC. This sponsorship overkill suggests a wider political purpose for the paper. Politics aside, the paper says essentially that the 1979-1999 satellite record would have shown a stronger warming, more consistent with the surface record, - and more consistent with the models - had it not been for the intervention of two volcanic eruptions forcing down temperatures. `We wuz robbed' is the between-the-lines message. This claim ignores three important factors. First, the lower troposphere, being transparent to sunlight, cannot be warmed or cooled except in response to changes in temperature at the surface. In other words, if the troposphere was cooled by the volcanoes, it could only have happened through surface cooling first, followed by the troposphere. This being the case, why does the surface record not show the same level of cooling? Second, volcanoes big enough to impact on climate are part of the normal climatic background anyway. They happen on average about once per decade, the last one being Pinatubo in 1992. Third, while volcanoes do indeed push down temperatures temporarily, El Ni�o events do the reverse and force up temperatures for a time. Since 1979, we have had two major volcanoes, two major El Ni�o events, plus two minor El Ni�oes. In other words, these natural events over 22 years are largely self-cancelling, leaving a satellite record giving us a reasonable representation of the real climate of the lower atmosphere - i.e. a global climate with little or no warming. Since volcanoes and El Ni�oes are part and parcel of the normal climate background, it is scientific nonsense to conjure up a statistical scheme where these periodic events are wished out of existence in order to prop up a bogus claim that warming really did happen after all. Some governments are already wise to these political manoevres by over-funded greenhouse institutions, which may explain the reluctance of many, including Australia, to ratify the Kyoto Protocol whose whole rationale is based on these dubious claims. Following from the claim by CRU that the highly urbanised `central England' had its warmest October on record (not surprising with all the urban development and concrete), it is now claimed that October was also the warmest month globally - again based on a surface network of mostly city-based and Third World thermometers. So, a reality check is in order. Here is global temperature as measured properly - from satellites giving an even coverage of the earth without all the errors from heat islands and sub-standard data from developing countries. October 2001 is not even the warmest in the 23-year satellite record, let alone in the last 150 years. It is merely the 6th warmest. October 2001 comes in at 0.145�C above the long term average. Five years were warmer - 1979 (0.148�C), 1987 (0.234�C), 1988 (0.149�C), 1990 (0.154�C), and the big El Ni�o year 1998 (0.35�C). The greenhouse industry is now falling over itself trying to find new `all-time records', usually based on faulty data, to frighten governments and the public into believing that things are bad, bad, bad. It's time they took notice of the satellite record, the only true record of global temperature, and took a cold shower. "ANKARA - The eastern part of Turkey struggles with the severest cold wave in twenty years. 700 villages are inaccessible because of heavy snowfall. Yesterday night the temperature in the province of Erzurum was falling to 34 degrees below freezing point." Enron Corporation may be a corporate Green - they are also broke. They filed for bankruptcy this week. "Skeptics are a strange bunch. Certainly, a healthy dose of skepticism is essential to science and crucial to helping us all weed out truth from the everyday noise of media and advertising. But there are those who, in spite of overwhelming evidence, still cling to theories and beliefs that have little basis in fact. Some of these "skeptics" deny evolution, others deny that the world is round and, increasingly, some deny that human impact on the environment poses a serious threat to society, and to life in general." Notice the polished inclusive way he glides from creationists and flat-earthers onto the `skeptics', with the obvious inference being that climate skeptics must share the same degree of irrationality and blindness to evidence as the creationists and flat-earthers do. Since Suzuki was so insulting of skeptics, what can be said in return about Suzuki himself? Is he the personification of sober and honest science as he professes to be, or is he the `Liberace of Junk Science and Self-Promotion' as one of his critics described him? Just as readers can judge for themselves whether this website warrants Suzuki's caricature of skeptics as being comparable to creationists and flat-earthers, his website should be similarly judged. Is his site all about science - or `self-promotion'? Suzuki referred to the "deep pockets and influence of some big businesses that have vested interests in maintaining the status quo". To see which of the two websites has the `deepest pocket', one need only compare the simple and inexpensive text and graphics used on this site, with the expensive Java-rich professional polish of his website. It takes little imagination to see which of them has the `deepest pocket'. 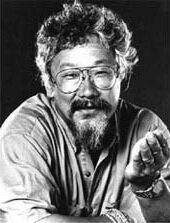 There is a strong element of personality cult in all of Suzuki's publications, media activities, and website, truly a legend in his own imagination. What prompted his ad hominem attack on climate skeptics was the recent publication of a single book - "The Skeptical Environmentalist" by Danish author Bjorn Lomborg. A cursory survey of search engines with the key phrase `global warming' will produce thousands of listed pages, probably 95% or more, supporting the global warming scare. So what is so threatening to Suzuki in the publication of a single book which dissents against the opinions of people like Suzuki? His response to the slightest criticism of him or his ideas is amply demonstrated in this Ottawa Citizen story from 1999. Only someone who shows contempt for the free speech of others would find it so intolerable for the megaphone of the greenhouse industry to be challenged by one dissenting whisper. Interviewer: "On the environment, the headline in the 'Financial Review' today -- "Kyoto deal sidelines Australia." Even Kyoto sceptics, like Japan and Russia, are now amongst 165 countries about to ratify the protocol. How can you continue to justify being so out of step with everyone with virtually the exception of America?" "Well, it's a pretty big exception!" "There's a lot of other countries ..."
"Yes, but the line Australia takes is that we are in favour of world agreement. We are already meeting some of the targets that have come out of the Kyoto and the Bonn discussions, but we don't believe you can have an effective worldwide agreement without the major industrialised country, which is America, plus the developing countries. This country will suffer if we were to ratify an agreement that didn't include the developing countries, because, in blunt terms, dirty industries, if I can put it that way, would leave Australia, go to developing countries -- and Australian jobs would go with them, and I would -- on that occasion, somebody like Doug Cameron*, who's hardly a supporter of mine, would be entitled to say the Government has agreed to the export of manufacturing and industrial jobs from this country and he'd be right, too." Note that Howard now includes not only U.S. participation as a condition of Australian involvement, but also the participation of developing countries. In recent negotiations it has become clear that developing countries are eager to collect on the money they would earn from carbon `credits' and `clean development mechanisms' in the short term, but have so far refused to even discuss their involvement in later emission controls. It's clearly a case of `take the cash and run' on their part. While the European Union may be foolish enough to engage in such a one-sided process, the newly re-elected Australian government is clearly not prepared to join them in the rush over an economic cliff. Researchers from the Lamont-Doherty Earth Observatory in Palisades, New York, have announced new findings in Science that the sun is largely responsible for past climate changes. A study of seafloor debris left over from ancient icebergs and dated from shells deposited at the same time and place, revealed a cyclic 1,500-year pattern of warming and cooling. These correspond to solar behaviour determined from C14 isotopes gathered from tree rings. Gerard C. Bond speaking to CNN about the findings said, "The connection we observed is that the increases in icebergs and drift ice occur at the same times as the increase in (carbon-14), which means the sun was weaker". He further said that the Earth's temperature is still recovering from the Little Ice Age (AD 1400-1890) when ocean temperatures dropped by 2 to 3 degrees. He said the variability in sunlight within this cycle is less than 0.1 percent, yet is sufficient to trigger severe climatic changes such as the Little Ice Age, the effect of which extends from the high northern latitudes down maybe even to the tropics. "Whether the whole earth is affected, we don't know for sure yet, but it is certainly implied." These findings beg the question as to why the IPCC still promotes the discredited `Hockey Stick' characterisation of the last 1,000 years of climate, where the existence of both the Medieval Warm Period and the Little Ice Age are denied in the face of a mountain of evidence to the contrary. This new study on the effect of the sun only reinforces the fact that the `Hockey Stick' has misrepresented past climates as a means to promote the political agenda of the IPCC. More interestingly, Bond drew attention to the glacial-interglacial cycle where, based on the 1,500-year solar cycle, the Earth's next ice age proper could occur about the year 3,100, plus or minus 500 years. That means people 600 years from now will be facing the serious possibility of the imminent onset of a full 80,000-year ice age. They might not thank us for getting so hysterical today about greenhouse gases, the only mechanism which could possibly moderate that future - and inevitable - event. The name `Greenland' was an ancient confidence trick played by early Viking explorers to persuade unsuspecting countrymen to migrate from the relative security of Norway to this harsh new land of ice. It was a sick joke then, and it is little different now in the hands of over-zealous greenhouse scientists searching for the `smoking gun' of global warming. We had the discredited `water at the North Pole' fiasco last year, and now the spotlight is on Greenland - just in time for the Marrakech COP7 climate conference. The timing is purely coincidental of course. Of course. A new paper in Nature (Paterson & Reeh, `Thinning of the Ice Sheet in Northwest Greenland over the Past Forty Years", Nature, v.414, p.60, 1 Nov 2001) claims, as the paper's title suggests, to have found thinning of the ice sheet in the northern part of Greenland between 1954 and 1995. At this point the environmental media will rush away and post another `smoking gun' story. But the devil is in the details. The authors concluded that the thinning occurred in the western half of the transect (the black line across the map), but that the eastern half had thickened. While the 1995 measurements were made with the latest techniques in satellite altimetry, giving an ice height accuracy to a few centimetres, the 1954 data against which it is being compared was much less reliable. The point marked `B73' on the map was the position of a tripod used by the British North Greenland Expedition of 1953-54 to survey the heights of 300 points along the 1,200-km transect using trigonometric levelling. The problem was that the height of B73 ended up as different depending on which coast it was levelled from, an error of 11.8 metres. The authors used statistical processing to resolve the error, a somewhat pointless exercise since it means making assumptions which may not be valid. `Splitting the difference' does not establish any kind of accuracy here. So, on the basis of faulty data from 1954, the authors were being both naive and disingenuous to claim anything about relative ice thickness changes since then. The exercise became a game of juggling statistics, nothing more. Their findings were further eroded when by their own admission, published evidence from last year established that the ice had thickened slightly between 1994 and 2000 in the very western part of the transect which they said had thinned. The authors attributed this recent ice thickening to `snow accumulation' (the usual reason why ice thickens). It seems to have not occurred to them that the thinning they claim may never have happened and that their results may be compromised by incorrect height data from 1954. But then, COP7 will not want to know about that. According to the BBC, the `Central England Temperature' (CET) in October was at an all-time high. Even assuming the British got their computers working properly this time (something we can't take for granted), would it be so surprising if the CET was rising? Central England is one of the most heavily populated regions on the planet, being home to tens of millions of people in an area hardly bigger than the state of Maine in the U.S. or Tasmania. Here is what it looks like from space at night. It contains huge cities, with the intervening `countryside' dotted with smaller towns and cities. These all linked by a large network of crowded motorways and other main roads. It is a hive of industry, and the heat islands from each urban centre are so close to each other that the whole of central England must by now have become one vast urban heat island. This means temperature there must be rising even where temperatures in genuinely rural areas are not (see Valentia as an example here). The British Isles are also one region which the satellite record shows as a localised `hot spot', even though the rest of the world shows little or no warming. During the Australian federal election held today, Prime Minister John Howard and his coalition government has been re-elected with an increased majority in the federal Parliament. The Kyoto Protocol, in spite of the popping of the champagne corks at Marrakech, remains a stillborn instrument as the Australian government has opposed ratification without U.S. participation, a government which has been re-elected with an increased majority. Without Australian or U.S. participation, the protocol is doomed to irrelevance. In wider foreign foreign policy terms, the re-election of the coalition is an electoral endorsement of the Australian government policy against terrorism, and of the coalition realignment of Australia toward it's traditional relationships and alliances with the U.S. and Britain. The latest instalment in the ongoing circus of extravagant climate conferences, `COP7', is now convened at Marrakech in Morocco, with the U.S. out of the Kyoto process and Australia in the middle of a distracting federal election. Jan Pronk, the Dutch president of the conference has appealed to all parties to stick to tying up what was agreed at Bonn in June and not open up new contentious issues - such as the lack of warming at the host city (shown left). While Tuvalu in the Pacific shows no sea level rise, the Indian Ocean too has coral atolls which are claimed to be under threat from sea level rise, particularly the Maldives and the Chagos Archipelago. This record from Diego Garcia on the Chagos (right in the centre of the Indian Ocean) shows such claims are unfounded and alarmist. It's a fragmented, short record, with periodic peaks, but there's no evidence to justify fears of inundation. Upward-trending graphs of global surface temperatures are often treated as evidence of global warming on the assumption that weather stations only record climatic changes, as opposed to, say, growth in economic activity in the vicinity of the instruments, or the deterioration of the measurement infrastructure. To test this assumption, Ross McKitrick, a professor at Guelph University in Canada, developed an empirical model that separately identified climatic, economic and measurement effects on surface temperature records. Monthly surface temperature records from 1979 to 2000 were obtained from 218 individual sites in 93 countries. A linear trend coefficient was computed for each site. Then satellite temperatures for the lower troposphere were obtained for each of the same locations over the same time period, and the location-specific trend was computed. Next, indicators of local economic activity (income, GDP growth rates, coal and oil use) and local measurement skill (the number of missing observations, local literacy and a dummy for Soviet Bloc membership) were determined. After controlling for air temperature changes, the spatial pattern of measured trends was shown to be affected by local income levels, literacy and whether the data came from the former Soviet Union. Using his regression model to remove these effects revealed an underlying global warming trend of about one-fifth the conventionally-reported magnitude. It is a normal scientific practice that any expressed or implied assumption which underpins a theory should be thoroughly examined in case they are incorrectly estimated. Two recent papers put question marks against some key IPCC assumptions about how the global climate will develop over the next 100 years. The first assumption by the IPCC is that oil and gas will continue to be a major fossil fuel right up to 2100 with all that implies for emissions of CO2 to the atmosphere. However, a paper by Jean Laherrere presented at the IEA meeting at Laxenburg, Austria in June 19, 2001 showed that discoveries of new oil reserves are not keeping pace with production and demand. According to Laherrere, "data on past discoveries and production shows that oil and gas liquids will peak before 2010, and that natural gas will peak around 2030. The IPCC assumptions on energy up to 2100 are accordingly unrealistic being based on cheap and abundant oil and gas". In other words, the IPCC have over-estimated the level of emissions over the next century from the oil and gas sector, and that emissions of atmospheric CO2 by the year 2100 will be consequently much less than currently estimated. The second assumption by the IPCC was that CO2 release from soil microbial activity would increase if the temperature was warmer. But according to a new paper in Nature (413:622-625), field trials were conducted on the Oklahoma grasslands using infra-red lamps to warm the soil by 2�C. The resulting increase in CO2 release or `respiration' was then measured. The researchers found that although there was a CO2 increase, it was much smaller than previously assumed, particularly during the second year. This means that this major source of atmospheric CO2 has also been over-estimated by the IPCC. Current models are run on the basis of a 1% increase in CO2 per year. However, the increase for 2000 was just 1.1 ppm, or 0.3%, not 1%. The IPCC really should re-examine these and other assumptions they make about future CO2, such as assumptions about population growth, economic growth, and the effect of new technologies. The more these assumptions are tested, the less tenable are the more extreme predictions of the IPCC, even using existing models. Tuvalu, an island nation of 10,000 people on nine low lying atolls in the South Pacific, have now conned the New Zealand government into accepting an annual quota of Tuvaluans as `environmental refugees', citing rising sea levels from climate change as their justification (See BBC report here). In concluding the agreement, the Tuvalu government condemned Australia and the USA for not embracing the Kyoto Protocol and for not joining with New Zealand in accepting `responsibility' for Tuvalu's real or imagined fate. Since the total area of Tuvalu is only 26 square kilometres, that makes the population density of the islands nearly 400 people per sq. km. (a high density figure by world standards). The capital of Tuvalu is Funafuti, and it has had a tide gauge installed there for years, its data being checked by the National Tidal Facility in Adelaide, Australia. The sea level record is shown below. There is no sea level rise, merely periodic falls in sea level during El Ni�o events. Tuvalu has merely taken the forward predictions of the IPCC and is pretending they are happening now. The environmental media (and apparently the New Zealand government) clearly cannot tell the difference between an observed event in the present and one projected for some future time. Tuvalu has exploited that uncritical mindset to press their claim that they were already victims of sea level rise, when in fact they are not. The reported `plight' of the Tuvaluans is not about sea level rise at all - it's about over-population. With such a high population density, the fresh water table on the atolls is subject to rapid depletion, especially in dry years. In addition, the development which would follow from such a high density will bring the inevitable coastal erosion, a problem which the Tuvalu government falsely blames on climate change and sea level rise. Tide gauge data from all around the South Pacific shows the same pattern as the one at Funafuti - no sea level rise. It is, and always was, a bogus claim, with few in the outside world bothering to check the accuracy of the claim. Radio Australia blew the whistle on the scam, (transcript here), reporting that the latest sea level result for June 2001 shows a sea level actually a few centimetres below what it was in March 1993 when a new high-tech tide gauge was installed. During El Ni�o events sea level drops about 30 centimetres. Of course, the Tuvaluans in their bid to get international refugee status may be pulling the old statisticians trick - claiming a sea level rise on the basis of a very selective time frame, say from mid-1998 to the present, a period when sea level merely recovered from the temporary low of the 1998 El Ni�o to the normal level of today. Hard on the heels of COP6-markII in Bonn comes COP7 (29th October to 9th November) in Marrakech, Morocco, only 4 months later, yet another expense-account junket to an exotic location for weary public servants. The U.S. has pulled out of the Kyoto process, and since the bombing of the World Trade Center, the U.S. government has had a complete re-ordering of its priorities since COP6-II. Not only is its participation at COP7 likely to be token only, the prior location of the conference in an Islamic country is likely to raise a whole new set of security concerns about the conference venue itself and those attending it. Australia's role at COP7 will be less clear. Australia is now in the throes of a federal election campaign, with the election date being set for 10th November. In other words, COP7 will convene during the final week of the election campaign when the party leaders will have more pressing matters on their minds than the minutae of the fine print on COP7 documents and communiques. Both the government party and the opposition have similar policies on the Kyoto Protocol - "We support the Kyoto Protocol, but....", the policies themselves all contained in that damning `but'. It is traditional during Australian elections that the government party adopt a strictly caretaker role during the 4-week campaign period, consulting the opposition if any urgent policy decisions need to be made during that month. In the context of COP7, this means that the Australian delegation will be very much in `hold' mode, avoiding any binding commitments. Only when the election is over will the new government be free to make decisions arising from COP7, by which time the electoral pressures will be off. On foreign policy matters (such as the war on terrorism and on the Kyoto Protocol), both major parties follow similar policies, often on a bi-partisan basis, so little change in the Australian position should be expected either at COP7 or after the election. - In a reversal of its previous cautious policy, the opposition Labour Party now says it will ratify the Kyoto Protocol if elected to government on 10th November. This is clearly aimed at appeasing urban environmentalists in order to secure their second preference votes, at the expense of jobs in the coal export and energy industries. They need these preferences because the government coalition is currently well ahead in the opinion polls. With their usual ungracious response, the Greens say they are not impressed by Labour's commitment to ratify the protocol. They make one valid point - that Labour have failed to show how emission cuts could be made, making the promise an empty gesture for electoral purposes. The latest opinion polls put the government coalition 10 percent ahead of the Labour opposition, with 4 weeks to go to the election. The environment has so far had a very low ranking as an election issue. Here is the latest history of CO2 in the atmosphere as measured at Mauna Loa, Hawaii. A full 0 - 600 ppm scale is used to show the full amount of CO2 currently in the atmosphere and to show the pre-industrial level of 280 ppm and the hypothetical doubling point at 560 ppm. The IPCC prefers to use near-vertical graphs just to scare people. The undead Kyoto Protocol, has hit a new snag, this time in Australia. The parliamentary `Joint Standing Committee on Treaties' (JSCOT), which advises the Australian federal Parliament on treaty ratifications, has just issued a status report (27 Sept) on its ongoing inquiry into the Kyoto Protocol. It has repeated its view expressed earlier this year that "...there are many difficult issues associated with the design, scope and implementation of the Protocol that have yet to be resolved. Until these issues are resolved it will not be possible to predict accurately the domestic impact of the emissions targets specified in the Protocol". "While an international consensus was forged on some issues at the Conference of Parties held in Bonn in July 2001, many significant and complex issues remain unresolved. Indeed, there is now renewed international debate about whether the Kyoto Protocol is the best means of advancing consideration of these issues." With the U.S. out of the Kyoto game, all it takes now is for one more significant OECD country to withdraw from the Kyoto circus for the Protocol to be finally laid to rest. The JSCOT status report is signalling that Australia could be the next to pull that plug. As a result of these reservations, JSCOT regards it as "imprudent to provide definitive advice to Parliament on whether Australia should ratify the Protocol." It seems the Bonn champagne has gone flat already. The forecourt of the U.S. Consulate-General in Melbourne, knee-deep in flowers and tributes. The aroma from so many flowers carried for a full city block. All flags in the city, and throughout Australia, were flying at half-mast. My reason for visiting the U.S. Consulate was to obtain a visitor's visa to the U.S. for an extended visit I intend to make there during May and June of next year. At the end of my mainland trip, I also visited the CSIRO Atmospheric Division at Aspendale near Melbourne, where I was treated cordially and shown a lot of the work they do, much of it unrelated to greenhouse. Of particular interest was their `gaslab', where large stainless steel bottles are stored, containing compressed air from atmospheric monitoring stations around the world. Some of the bottles contain samples going back to the 1950s and are thus an invaluable archive of physical evidence of past and present atmospheric composition. The air samples are analysed at Aspendale for changes to gas composition over time. In addition, they also keep ice cores in cold storage in order to analyse the content of trapped air bubbles. My thanks to Paul Holper and his colleagues for their hospitality in showing me their operations - and in fielding an awful lot of questions. During my absence last week, I was a guest speaker at a weekend convention held at Coffs Harbour, New South Wales, by the Institution of Engineers, Australia (IEA). The theme of the convention was `Greenhouse - Fiction or Fact?'. There were several other speakers, including Dr Chris Mitchell of the CSIRO who spoke on the IPCC view of climate change. While some in the greenhouse industry try to suppress public debate with the `the debate is over' line, the theme of the convention indicated that the debate is still very much alive, particularly among engineers who would be in the front line of any measures to reduce CO2 emissions. During subsequent discussions, it was also very clear that the engineers, while being cautious about the IPCC claims, were also thinking in terms of carbon removal from fossil fuel combusion rather than preventing the use of fossil fuels as the Greens would prefer. Many of the `renewable' energy types were discussed, but the engineers found most, if not all, of them to be seriously flawed due to problems of energy storage and transmission distance, issues which are too often glossed over by environmentalists, but which are central to the way engineers would view them. A new study (Zhou & Myeni, J. Geophys. Res., 106(D17): 20069-20083), combines a triumph of technology with a failure to analyse the cause of the effect they so thoroughly observed, a failure so elementary that it raises questions as to what use is `peer review' when neither the authors nor the `peers' could see the obvious flaws in their attribution argument. The authors used an NDVI (Normalized Difference Vegetation Index) index which measures the colour of the radiation coming up from the earth's surface to orbiting satellites. This colour is directly related to the density of vegetation. As vegetation changes, so does the colour. The researchers found that since 1981, vegetation has been growing more vigorously than before, reflecting a denser growth of vegetation in the areas shown on the map (left). studies of both individual species and in repeat photography of the American landscape. It is in attributing the cause of this vegetation surge that the authors did the orthodox thing and pandered to the global warming theory. They blamed the accelerated growth on temperature increases. Their `proof'? Their chart (left) compares the temperature of North America with plant growth. The first thing to note is that the correlation is very poor. Note the sharply increased greening in the early to mid 1980s in spite of little temperature movement. Greening increased in 1989, 1995, in spite of falling temperatures, while greening is at a high in 2000 in spite of only average temperature for that year. But note the title of the graph which says North America 40N - 70N, a set of latitudes which excludes the whole southern half of the U.S. Yet the latitude circle on the map above shows a wide circle around 30N, not 40N. In other words, the authors included the southern half of the U.S. to pitch their greenness message, but then excluded it from their temperature comparison - and for very good reason. The southern half of the U.S. includes the large red area in the south-eastern states (map), where vegetation has been increasing at a high rate in spite of cooling temperatures in that whole south-eastern region of the U.S. Had they made their temperature comparison from 30N instead of 40N, the temperature part of the graph would have looked a lot different as it would have had to include the southeast cooling, the very region where the increasing greenness was at its greatest in the U.S. The weak correlation between greenness and temperature would have all but disappeared and left them with no way to attribute the vegetation growth to warming. See Station of the Week for examples of south-eastern U.S. temperature. The real cause of the greening of the earth is abundantly clear. It is the Fertilizer Effect of CO2, not warming. That the authors should play with latitudes to make a weak case to the contrary was a disappointing note to what is an otherwise exciting finding - that the Earth is greening, a positive outcome from atmospheric CO2 enhancement. 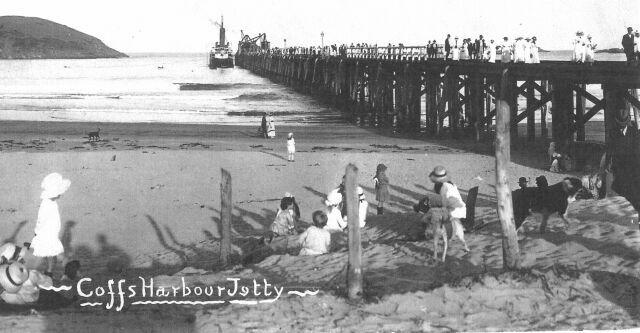 Here we see two photos of the jetty at Coffs Harbour taken 80 years apart, the first being taken in the early 1920s, the second taken by myself only last week during my visit there. (or about 4 to 12 inches). It's hard to see any sea level change at all between these two photos, certainly nothing which has made any noticeable difference either to the beach or the jetty. The venerable British Broadcasting Corporation, or BBC, otherwise known as `Aunty', must be getting sick and tired of the torrent of global warming stories coming from the greenhouse industry. Now Aunty has taken an each way bet and presents two simultaneous stories, one predicting a warming future for Britain, the other predicting an ice age. Since the British love being scared by weather stories, Aunty has obviously decided to be all things to all people. In a paper titled `Devil in the Detail' in Science (v.293, 7 Sept 2001, p.1777), David Vaughan et al. report on an analysis of Antarctic temperatures, comparing them with the British HADCM3 climate model. The model comes out very badly when its predictions are matched with reality. The small area of the Antarctic known as the Antarctic Peninsula (about the size of Britain or 2% of the Antarctic, some of which is actually outside the Antartic Circle) is the only part of Antarctica to have warmed in the last 50 years. The authors suggest three possible causes, a shift in ocean current flows being the most credible given the peninsula's direct exposure to the Southern Ocean. The rest of Antarctica (98% of the continent) has not warmed at all, and some of it, particularly the interior, has cooled, including the South Pole itself. But that's not what the model says. It shows the interior to warm up, the biggest warming to occur in the very part where the cooling has been greatest, while areas adjacent to the peninsula are shown to cool! The peninsula itself is shown to be quite neutral. If the model can't get the regions right, their global accuracy can be no better since global warming has to be the sum total of all the regional changes. The latest antics of the Green lobby is to turn to the legal system to achieve what Kyoto failed to do - to force reductions in fossil fuel energy usage, not by the Rule of Law, but by the Rule of Lawyers. Their plan is for environmental groups to sponsor lawsuits against the `major polluters' who `cause' global warming, by citing the alleged damage resulting from the claimed warming. Good old Tuvalu was mentioned yet again as a possible plaintiff, Tuvalu being an island atoll group in the Pacific (and whose own tide gauge shows no sea level rise at all - click here to see the Tuvalu sea level data). But there could be problems with a lawsuit of this kind. The first is that ACTUAL DAMAGE would have to be proved, not merely inferred or predicted. The second is that the defendants (whoever they turn out to be) would have to be shown to have behaved unreasonably, even though they have operated within existing laws and observed every environmental regulation imposed upon them. But the best part of such a case would be this - the global warming theory would have to prove and justify itself under vigorous cross examination, not just to `mate's review' as currently practiced in the journals. Now, that would be an interesting spectacle! According to the ABC network, this is the coolest summer since 1987 in Los Angeles and the nearby San Fernando Valley. The downtown temperatures are reported to be 4�F below normal for this time of year. According to the National Weather Service, the cooler temperatures have been caused by lingering cooler air sucked in from the Pacific Ocean by rising desert air inland. This normally only happens in June, but this year has extended into July and August. - All we need now is for someone to blame it on global warming. New Scientist magazine, a long-standing promoter of global warming, has now resorted to science fiction to scare a public already jaded by failed predictions. In an article titled `Climate Change Scenario', the reader is taken forward in time to the year 2091 to read a hypothetical interview with a `science historian and author' of that future time. Of course, the interview treats what are only the most outlandish and extreme of predictions today as accomplished facts by then. And, you guessed it, things turned out much worse than previously thought. Of course they did - in the warped world of environmental sciences and politics, things are always `much worse than previously feared'. A picture was painted of a world in a state of runaway greenhouse warming, with mega-droughts, pestilence, mega-floods and numerous other horrors lurking in the overactive imaginations of greenhouse zealots. El Ni�o had become a permanent climate fixture and all the sea ice had disappeared. There was zero good news. The skeptics of today were not forgotten, being portrayed as a `movement' who were denying the reality of global warming. The fiction piece adroitly side-stepped the lack of warming `100 years ago' (i.e. today) in the free troposphere, as measured by the satellites, with this - "The guys from CCOOL still argue about what masked tropospheric warming in those early days. Whatever it was (sic. ), it didn't last." With that tiresome little difficulty out of the way, the rant continued about the runaway greenhouse catastrophe (something not even the most extreme of climatologists nor the most extreme of models predict). The big villian in the piece was given as water! Lots of it. More floods, more water vapour in the air, more high clouds (which warm), but, of course, no extra low clouds (which cool). New Scientist portrayed a world in which the greenhouse effect had gone into a runaway overdrive, out of control, even with fossil fuels banned. Then to add high farce to an already ridiculous scenario, they added that the warming might even trigger off an ice age in Europe! That such nonsense can be published by New Scientist, tells us little about climate change, but tells us an awful lot about the breed of new scientist that New Scientist speaks for. CRU are not the only institution to be causing confusion with their temperature graphs. The NASA Goddard Institute for Space Studies (GISS) in New York also compiles surface temperature averages and is now showing new charts of historical U.S. temperature which are different to the same charts produced by them a year or so earlier. The effect of the latest version of GISS's U.S. climate history is for the 1930's temperatures (the warmest period of the 20th century) to be reduced, while those for the 1990's are increased. In the previous version, the 1930s was clearly warmer than the 1990's, a point frequently made by skeptics given that greenhouse gases could hardly be blamed for the 1930s warmth. However, in the latest version, the 1990's has almost caught up to the 1930s. Here is a `wiggle' graph to show the `before' and `after' situation. restarted by clicking on the "Refresh/Reload" button on the tool bar. Update: 1st Sept 2001 - James Hanson who heads GISS says that an explanation for the above changes will all be explained in a yet-to-be published paper in Journal of Geophysical Research. Not before time, as according to Jerry Brennan, the above graphs put a whole new meaning to the term `climate change science'. It may come as surprising news to many non-Australians, but snow skiing is a very popular sporting pastime in Australia. The overseas perception of Australia is that of a land of roasting deserts, bronzed beach lovers, surfies, and world champion swimmers (yes, we do have sympathies for the US swimmers who returned home from Sydney shell-shocked from the Olympic pool by the Australian swimmers). Ten years ago, the ski resorts were told by leading climatologists they had no future. Ten years later, Australia is enjoying a bumper season at its numerous ski resorts in Victoria and New South Wales with strange names like Thredbo, Perisher Blue, and Mt. Baw Baw. It is reported this is one of the best seasons ever, with snow in abundance. It follows on top of a bumper season last year, and successful seasons throughout the `warm' 1990s. For the latest snow reports on all the Australian ski resorts, beginning with Perisher Blue, click here. For months, we have been waiting for the year 2000 CO2 growth figures from Mauna Loa, Hawaii, and now they have just been released. The figure for atmospheric CO2 growth in 2000 was only 1.11 ppm. This compares with the value of 2.14 ppm increase for 1998, partly caused by the strong El Ni�o of that year. Since 2000 was described as `warm' by the greenhouse industry, it is all the more significant that CO2 growth should fall to 1.11 ppm in spite of that `warmth', and the strong economic activity of that year. The predictions of the IPCC that the world may be up to +6�C warmer due to rising CO2 by the year 2100 are based entirely on climate models. These models in turn rely on one key assumption - that CO2 will grow at 1% per year. That means CO2 in 2000 should have risen 3.7 ppm, not 1.11 ppm. In fact, CO2 has never risen in any single year by that 1% target figure. The 2000 rise is only +0.3%, far short of the figure assumed by the models. This means it may be 2450 AD or later before that particular IPCC prediction can be fulfilled.